Each song on the album gives some thought to the question of what it means to be a woman in the 21st Century. 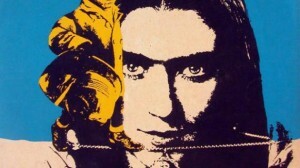 Expect to hear a wide range of musical insights which question this theme, ranging from the personal to the political: the bitter sweet to the lyrical. This album is free to download and features ‘A Message from Dorothy from the Other Side’ by Gertrude as well as a variety of other artists -each with their own unique take on the subject at hand. 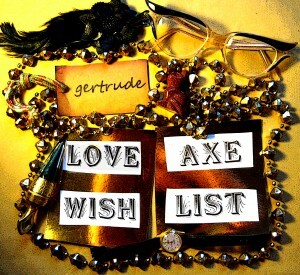 Gertrude released a new album called Love Axe Wish List in November 2013 on their own record label, Urban Missfits. Gertrude are an alternative 4 piece band – based in and around London. They formed as a collective in 1996 after two members met in a self organised communal house in the East End. Originally a 5 piece – Gertrude soon caused a stir in many different London ‘scenes’. Due to the bands eclectic musical nature, they enjoy playing gigs in a wide variety of venues – such as onboard the Motorship Stubnitz or alongside ‘punk robots’ at a science/art event at the ICA. Gertrude can weave the electric cello, melodica,clarinet and keyboard with traditional rock instruments to create a unique melting pot of sound. Live, the band is energetic, rhythmic and intense – their set is often scattered with droll commentary and surreal musings. Gertrude like to draw their inspiration from all over the place especially from the variety of student, political and artistic scenes that exist within the city.They have been influenced by punk rock’s ‘DIY’ ethos, feminist thinkers as well as numerous other bands,ideas,people and events. Over the years Gertrude have been honored to support some really amazing bands such as:- Chumbawamba, The Slits, No means No, Fugazi and Shellac. The band have toured in Europe, Canada and the United States and have been asked to perform at various Ladyfest events. Gertrude have also learnt how to record, mix and produce their own tracks.Throughout 2012/2013 Gertrude were working on a new album called Love Axe Wish List which was recorded at Tigersonic studio and was finished at the band’s own Bentstring Studio in East London. This album was released in November 2013 on their own Urban Missfits label. Gertrude played at the Focus E15 campaign New year Eve party on December 31st 2014 and have taken a break from regular rehearsing since then. In the meantime Zoe, Dawn and Iona are developing a new comedy band called Rantipoles. Possibly in the future, Gertrude would like to collaborate with musicians, film makers, artists and event organisers, so if you have an interesting proposal for a collaborative project please do think about getting in contact. Thank you.